The shoot for Lingaa is on floors already and the team is in Mandya, Karnataka. 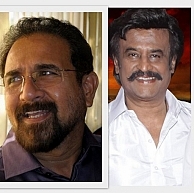 KS Ravikumar is wielding the megaphone of a Superstar Rajinikanth project for the third time. Sonakshi Sinha and Anushka will play Rajini’s two female leads and Jagapathy Babu is onboard too. Academy Award winner AR Rahman and cinematographer Rathnavelu will do their duties for the project. As a new addition art director Sabu Cyril, a four time National Award winner, including one for Enthiran, has hopped onboard project Lingaa. The team is apparently looking to complete the project as quickly as possible. Its official - Superstar Rajinikanth in Twitter!!! Sonakshi Sinha makes Rajini nervous! Another Nayagan with Suriya ? People looking for online information on Anushka, AR Rahman, Lingaa, Rajinikanth, Sabu Cyril, Sonakshi Sinha will find this news story useful.